Thank you so much for your honesty on the over-billing of the oil change, how refreshing. 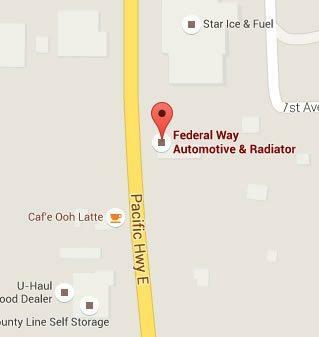 I will certainly pass on the honesty, integrity of Federal Way Automotive & Radiator to all my acquaintances. We wanted to thank you for all the help you have given us. My Celica has been running wonderfully since it was last there. Your persistence in finding it’s problem, your generosity, and your friendly service have been greatly appreciated. A business like yours is hard to find these days and it’s truly nice to know that people like you are still out there. Thanks a million! Thank you so much for donating the cooling system back flush and inspection! Every child at Seabury benefits from the funds raised at the auction, and community support like yours is truly priceless. I needed a auto repair place that was close to our location in Fife. I found you on DexKnows.com. We were having trouble with our battery going dead. I was told by Les Schwab, that the battery I had purchased from them a few months back was fine and the alternator had problems. That’s why I needed you. From the moment I walked into the office, Tracy demonstrated an exceptional level of customer service. I truly believe it’s not just because she is an owner. I got the feeling that she loves what she does and knows what she’s doing. The best part for me was when it was discovered there was nothing wrong with the alternator and the battery was bad. Tracy called to let me know. When I told here what Schwab told me, she asked which location I bought the battery from and asked if it would be ok to call them. I said it would be fine. A while later she called and told me she spoke to Tyler and he was ready to take care of the problem. And to top it all off, I incurred no charge from you guys fro what you did. Anyway, the van is scheduled to be transferred to our Oregon facility, but I have told everyone who will listen about the excellent level of service and friendly environment that I experienced. I am also a firm believer in sharing good experiences with people when they do well. Many times people find it much easier to complain than compliment, and I know I appreciate the occasional compliment. On a side note, the next time you have your post cards printed, I think it would be more interested to see a larger picture of the Federal Way Automotive & Radiator team and a smaller picture of the building.